One day last week, I walked in the clinic and smelled cinnamon rolls – or what I thought was cinnamon rolls. It was actually cinnamon roll cake, but it smelled just like yeasted cinnamon rolls. I won’t say I wasn’t tempted to eat a small piece, but I could tell it was basically swimming in butter and sugar and I had just ate breakfast so I resisted…barely ;). However, as fate would have it, I spotted a recipe for cinnamon roll cake on Pinterest over the weekend and come Monday I was practically dying for something cinnamon-y =). 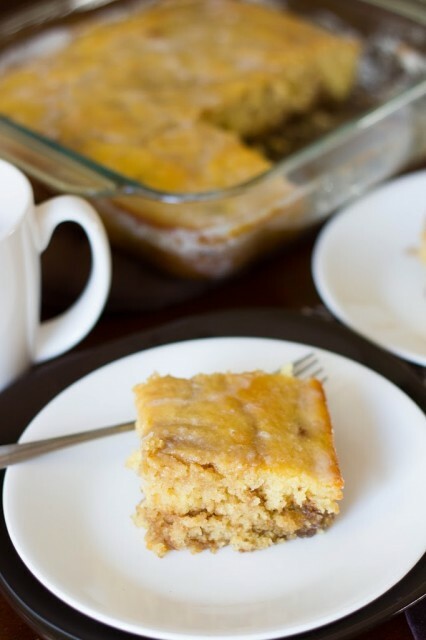 I googled cinnamon roll cake and came to the conclusion that I’m a couple years late because cinnamon roll cake took the blog world by storm about 2 years ago…haha. Oh well. And basically everyone used exactly the same recipe. But I couldn’t get past the fact that it had three sticks of butter! I found it hard to believe that much butter was necessary. I didn’t set out to make a “healthy” cinnamon roll cake. I just wanted to reduce the butter to a slightly more reasonable amount. I decided to cut the butter in half and see what happened. I replaced half the butter in the cake with fat-free greek yogurt and just omitted half the butter in the filling. It was A-MAZING! I really don’t see how more butter could have made it any better. It’s still definitely dessert and definitely NOT health food ;). Enjoy! 2. In large bowl, whisk (by hand) together the flour, salt, sugar, and baking powder. Whisk in milk, egg and vanilla until smooth. Whisk in the 2 tablespoons melted butter and yogurt. Pour batter into a greased 8 inch square baking pan. 3. Next, for the topping, mix the softened butter, brown sugar, flour, and cinnamon until well combined. Drop evenly over cake batter by spoonfuls and use a knife to marble/swirl through the cake. Be careful not to over-swirl. 4. Bake for 30-35 minutes or until toothpick comes out clean from center. 5. For the glaze, mix powdered sugar, milk and vanilla in a small bowl. 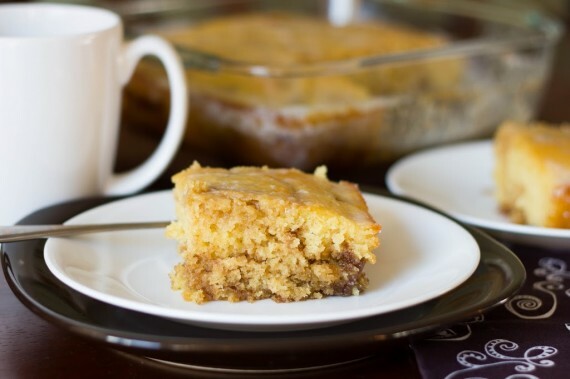 Whisk until smooth and pour over warm cake. Serve warm or at room temperature.